Suitcases are a must have item for holidays at home, vacations abroad, or extended work trips, and buying a quality case can mean the difference between luggage that lasts a lifetime and a bag left broken at the airport on its first use. There are thousand of suitcase options out there, though, and choosing the right one can seem tricker than trying to get the family packed for a three week vacation. This is why we have put together this suitcase buying guide, helping you choose the right suitcase with minimal hassle, leaving you enough time to pack and enjoy your next vacation. 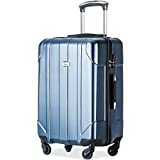 International Carry-On Suitcases: As the name suggests, international carry-on suitcases are ideally designed to match the carry-on bag restrictions that flights abroad enforce in order to ensure they fit in the overhead of the plane. These cases generally measure between 17 and 21 inches high and can hold up to 3 days of clothing. 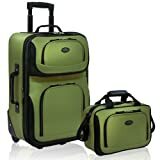 Domestic Carry-On Suitcases: These bigger carry-on suitcases are great for weekend trips and range between 22 to 24 inches in height. With enough space for a 4-day trip they are a handy addition to a luggage set. 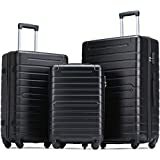 Medium Suitcases: Measuring 24-26 inches in height, these suitcase are perfect for up to a 7 day vacation. Holding a week’s worth of clothing, you can take this suitcase home for the holidays or for a week-long trip overseas. 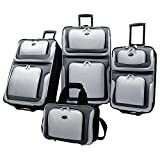 Large Suitcases: Large suitcases are the best solution for extended stays and longer trips. Up to 33 inches high, use large checked luggage for your next 3 week overseas vacation or share the bag with family members for a one week holiday, saving the hassle of carrying multiple bags. Hardside Suitcases: Hardside suitcases are usually made from ABS plastic and polycarbonates and are designed to take knocks. Durable, shock absorbent, waterproof, and scratch resistant, they offer consumers a great investment product. Softside Suitcases: Providing flexible builds for easier packing, softside suitcases have expandable designs so that capacity can be more easily adjusted. Often including extra pockets and other organizing features, they make traveling easy. 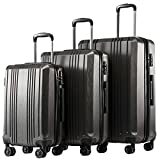 Spinner Suitcases: Spinner suitcases offer the maximum amount of movement. With multi-directional wheels, they can be pushed or pulled for easy direction changes and corner turning. 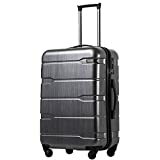 Spinner suitcases either come in hard or soft side designs and provide the most comfortable maneuvering. 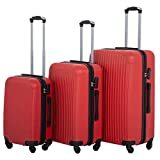 Rolling Suitcases: The most cost effective moving mechanisms, rolling suitcases can be easily pulled behind you or pushed from the front. Coming in an endless variety of styles and designs, they too can be either hard or soft sided. Build: Lightweight suitcases that are easy to carry but still have enough space are reviewed well by their owners. A light build means more weight can be allocated for the contents of the bag. Generally, buyers who have chosen a suitcase size based on their specific needs get much better use out of their purchases. 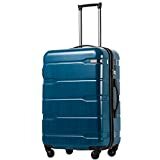 Wheels: When it comes to mobility and ease of pushing or pulling, wheels are a big deciding factor on whether reviewers rate a suitcase well or not. 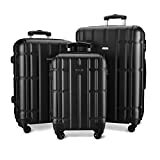 Spinner wheeled suitcases get the best wheel reviews all around and are a definite favorite for frequent travellers. Durability: Suitcases are an investment and luggage that is durable and can withstand years of travel are reviewed much better by commenters. This is a particular concern for frequent travelers, and choosing a good rated brand with an extended warranty will ensure the same piece of mind. A good suitcase is an investment and a low quality suitcase puts the contents inside at risk for damage or theft. Quality top rated brands will include long warranties to ensure you get many years of use. If you are buying a suitcase for your next flight, make sure it is within the domestic or international flight baggage size regulations. 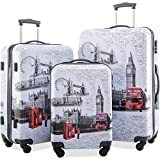 This may vary from airline to airline and from country to country and making sure your suitcase fits not only the weight but also the dimension limitations will prevent a lot of heartache if your suitcase is prevented from making the trip with you! Buy a suitcase that fits your trip to ensure more comfortable commuting. For a weekend trip, impromptu getaway, and short trips, carry-ons make a great choice. Packing for more than one? Choose a large suitcase for your next family vacation. Carry-ons with laptop storage are ideal for a quick business trip. Some interior suitcase features worth considering are water-resistant lining for easy cleaning and extra zipped compartments for storing a variety of things separately. 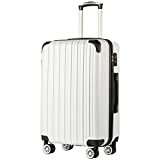 The best quality suitcases should have aircraft aluminum trolley handles that retract to at least two heights for comfortable pushing or pulling. 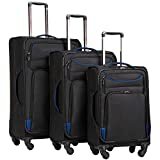 Suitcases come with a variety of wheel options, and units a large stable wheel base will prevent tipping and travels better. There are two types of suitcase wheels: inline and spinners. Inline wheels are fixed and making pushing and pulling easy. They wheel in one direction and good choice for infrequent travellers. Spinners are able to turn 360 degrees and give you a lot more mobility; an ideal choice to make travelling with large suitcases easier. Quality hardside luggage should be either ABS, 100% polycarbonate, or composite polycarbonate. ABS is a durable strong plastic and is a cost effective hardside suitcase choice. One-hundred percent polycarbonate is strong, flexible, and more lightweight and a good choice for world travelers, and composite polycarbonate is the a good value option. Softside suitcases are either made from ballistic nylon, coated canvas, or a polyester-nylon blend. Ballistic nylon suitcases are the best suitcase option if you are looking for a strong resistant fabric built to last, and are ideal for trips home for the holidays. Coated canvas or polyester-nylon suitcases are tough, lightweight, water-repellent, and ideal for the avid traveler or adventure holiday enthusiast. Some accessories worth considering that may or may not come with your new suitcase are small padlocks for extra security, a luggage scale to ensure your bag is never overweight for check in again, and luggage tags to identify the bag as yours and to make you easily contactable should it land up at the wrong destination. Samsonite: Samsonite is a luggage conglomerate with a long standing reputation for their quality suitcases, bags, and travel accessories since opening 100 years ago. 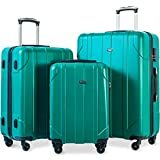 American Tourister: For over 75 years, American Tourister has aimed to produce quality travel luggage, suitcases, and bags for affordable prices. Heys: Heys International Ltd was established in 1986 and is known worldwide for their trendy, lightweight quality luggage. Itzy Ritzy: Aimed at and producing quality products for mothers, Itzy Ritzy are an ideal brand choice if you are looking for a fun, lightweight rolling suitcase for the kids.